The Lake Tahoe Triathlon occurs annually at Ed’ZBerg Sugar Pine State Park on the west shore of Lake Tahoe. Sugar Pine is truly one of Tahoe’s special lake side properties. Home of the Hellman-Ehrman Mansion this property features tall pines, a historic pier, beautiful grounds and spectacular beaches. You have the option of reserving a campsite through the Reserve California system. Be sure to book 6 months, to the day, in advance! The Lake Tahoe Triathlon is owned and operated by Big Blue Adventure, LLC. Big Blue Adventure produces many EPIC Tahoe events in and around Tahoe, including the Donner Lake Triathlon, XTERRA Tahoe City and XTERRA Lake Tahoe, Great Trail Race, Truckee Marathon, and others. Lake Tahoe Triathlon is located at Ed Z’berg Sugar Pine Point California State Park. The park is located on the west shore of Lake Tahoe, 10 miles south of Tahoe City on Highway 89. This is on the West shore of Lake Tahoe and can be accessed via Interstate 50 and 80. View by map, click here. Reno / Tahoe International offers 20 airlines, non-stop flights to 17 cities, 973 domestic flights and seven international flights departing weekly. Use the Interactive flight mapping tool for flight options. The fastest air option is the Truckee-Tahoe Airport welcomes private pilots and charter services. 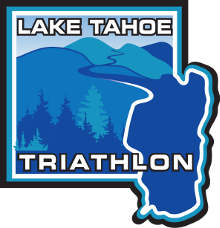 The Lake Tahoe Triathlon is sanctioned by USA Triathlon the National Governing Body of the sport of Triathlon. Our Race Director is USA Triathlon Certified. Download the rules! This document includes rules modifications for Physically Challenged Athletes. This .pdf version is for your personal use only. No part of these rules may be copied or reproduced without the express written consent of USA Triathlon. For permission, contact Charlie Crawford at the address above by e-mail or at (334) 332-9092.